One Less Gun: At about 8:30 PM on Saturday, April 13, 2019, members of the Youth Violence Strike Force conducted a motor vehicle in the area of Mount Pleasant Avenue and Vine Street in Roxbury, resulting in the arrest of one and the recovery of a loaded firearm. While in the area due to a call for shots fired, officers observed a motor vehicle idling on the road, facing the wrong direction, matching the description of a motor vehicle in area during a prior call for shots fired. Officers approached the vehicle and spoke to the operator after a query revealed the motor vehicle did not have a valid inspection sticker. While speaking with the operator, officers observed two additional occupants inside of the vehicle. Due to the recent call for shots fired and the motor vehicle matching the description of that which had been circling the area during the shots fired call, officers removed the occupants from the vehicle. Officers recovered a Ruger LC .380 semi-automatic firearm loaded with six rounds of live ammunition located in the area under the dashboard on the driver’s side. Further investigation of the firearm revealed it to have been reported stolen out of New Hampshire. Additionally, officers seized a large bag of marijuana and a digital scale from the vehicle. An undisclosed amount of US Currency was seized from the suspect during the booking process. Officers arrested the operator, Andre Fielder, 22-years-old, of Mattapan. Fielder is expected to be arraigned in Roxbury District Court on charges of Unlawful Possession of a Firearm, Unlawful Possession of Ammunition, Possession with Intend to Distribute Class D Drugs, and Receiving Stolen Property. The occupants were identified and released from the scene. BPD in the Community: Yesterday, on Friday April 12, 2019, volunteers around the city came together to participate in a Day of Service at several area schools with a shared mission of performing general clean up and making improvements to the school grounds. Several Boston Police cadets and officers helped students and staff members at the William Monroe Trotter K-8 School in Dorchester by making repairs to garden beds, replacing mulch and soil while planting new seasonal flowers. Thank you to all our department members for their participation and thank you to our friends at the Trotter School for their warm welcome. At about 11:46 AM on Friday, April 12, 2019, officers assigned to the Youth Violence Strike Force arrested Marco Victorino, 24, of Boston, in the area of 138 Crawford Street in Dorchester on several firearm related offenses stemming from an armed robbery that took place on Monday, April 8, 2019, at approximately 8:00 PM in the area of 233 Humbolt Avenue in Dorchester. At about 11:40 AM, officers observed Victorino in the area of 138 Crawford Street and when approached, Victorino refused to remove his hands from inside of his sweatshirt and continually attempted to bend over at the waist as if to conceal or prevent something from dropping from his pants. After observing the handle of a firearm, officers recovered a loaded Taurus G2C 9mm pistol with nine (9) live rounds of ammunition inside of a magazine capable of holding twelve (12) rounds which is considered to be a "high capacity magazine”. Victorino was placed under arrest and charged with Unlawful Possession of a Firearm, Unlawful Possession of Ammunition, Carrying a Loaded Firearm, and Possession of a Large Capacity Firearm. He will be arraigned in Roxbury District Court. ONE LESS GUN: At about 3:55 AM, on Friday, April 12, 2019, officers assigned to District B-2 arrested Alfred Brown, 60, of Roxbury while recovering a loaded firearm after responding to a call for shots fired in the area of 2 Charlame Street in Roxbury. On arrival, officers located an adult male victim who stated that he had just been shot at by a suspect who then fled into a nearby home. Officers quickly established a perimeter around the building before making a forced entry with the assistance of additional responding units from the Boston Police SWAT Team. Once inside, the officers were able to locate the suspect as he attempted to flee down a rear stair case at which time he was taken into custody after a brief struggle. Officers continued their investigation and soon located a loaded Colt revolver in an alley behind the house with the assistance of a BPD K-9 officer. It was later determined and confirmed that the weapon had been discarded by the suspect prior to entering the building. The suspect will appear in Roxbury District Court on charges of Unlawful Possession of a Firearm, Unlawful Possession of Ammunition, Carrying a Loaded Firearm, Discharging a Firearm within 500’ of a Dwelling and Armed Assault with Intent to Murder. One Less Gun: At about 8:10 PM on Wednesday, April 10, 2019, detectives and officers assigned to District B-2 (Roxbury) made an on-site warrant arrest in the area of 10 Smith Street in Roxbury. As part of an ongoing investigation officer conducted a traffic stop and subsequently arrested Keiver Gopaul, 28-years-old, of Dorchester on an active Dorchester District Court warrant for Armed Robbery. With the assistance of the K-9 Unit, officers recovered a .40 caliber Smith & Wesson M&P Shield firearm loaded with seven rounds of live ammunition from a secret compartment beneath the radio inside of the motor vehicle in which Gopaul was operating. Gopaul is expected to be arraigned in West Roxbury District Court on charged of Unlawful Possession of a Firearm, Unlawful Possession of Ammunition, and Carrying a Loaded Firearm on a Public Way, Armed Career Criminal Level 2. At about 10:39 PM on Wednesday, April 10, 2019, members of the Youth Violence Strike Force conducted a traffic stop in the area of 60 Seaver Street in Dorchester leading to the arrest of one and the recovery of a loaded firearm. While on patrol in the area of the above location, officers observed a motor vehicle pass through a stop sign without stopping. Due to the traffic infraction, officers conducted a motor vehicle stop. Officers approached the operator and illuminated the interior of the vehicle with their flashlights and observed what appeared to be the handle of a firearm protruding from the operator’s jacket on his person. The suspect was then removed from the vehicle. Officers recovered a Ruger LC .380 semi-automatic firearm loaded with five rounds of live ammunition from the suspect’s front jacket pocket. Officers arrested David Coleman, 23-years-old, of Brockton. Coleman is expected to be arraigned in Roxbury District Court on charges of Unlawful Possession of a Firearm, Unlawful Possession of a Loaded Firearm, and Unlawful Possession of Ammunition. Investigation Update: At approximately 8:08 AM on Sunday, April 7, 2019, officers assigned to District B-2 (Roxbury) responded to investigate a person in the area of 123 Terrace Street in Roxbury. On arrival, officers located a non-viable adult male victim. The victim was pronounced deceased at the scene. The victim has since been identified as Maximillian Carbone, 19-years-old, of Nahant. At this stage of the investigation, detectives do not believe the victim’s death to have occurred under suspicious circumstances. The Boston Police Department is actively reviewing the facts and circumstances surrounding this incident. Anyone with information is strongly urged to contact Boston Police District B-2 (Roxbury) Detectives at (617) 343-4275. Community members wishing to assist this search anonymously can do so by calling the CrimeStoppers Tip Line at 1 (800) 494-TIPS or by texting the word ‘TIP’ to CRIME (27463). The Boston Police Department will stringently guard and protect the identities of all those who wish to assist this investigation in an anonymous manner. Recent Promotions: Congratulations to Leighton Facey on his promotion from the rank of Lieutenant Detective to Captain, as well as, Mary Ann O’Neill and Sean Smith on their respective promotions from the rank of Sergeant to Lieutenant. During a ceremony held at Boston Police Headquarters earlier today, Friday, April 5, 2019, Commissioner Gross congratulated and presented the promotees with their new badges. The men and women of the BPD would like to wish Captain Facey, Lieutenant O’Neill and Lieutenant Smith nothing but the best of safety and success in their new leadership roles within the Boston Police Department. The Federal Bureau of Investigation Violent Crimes Task Force and the Boston Police Department are seeking the public’s assistance in identifying four individuals who were in the vicinity of Tremont Street and Stuart Street in Boston, Massachusetts at approximately 2:15 a.m. on Sunday, February 24, 2019. The individuals are not suspected of any wrongdoing and are being sought as witnesses in connection with the alleged kidnapping of 23-year-old Jassy Correia. The public is being asked to review a video and photos of the individuals (enhanced surveillance photos can be found at the bottom of this release). As seen in the video, the unknown male has facial hair and is wearing a dark jacket with a white undershirt and dark pants. Next to him is an unidentified female wearing a black dress with a dark green jacket and dark, knee-high boots. The unknown female next to her is pictured wearing a dark outfit with a tan jacket and black boots. The last female on the right is seen wearing a dark jacket over a multicolored dress, with knee-high, black boots. All four are believed to be in their 20s, have light skin, and dark hair. A social media campaign, including advertisements on Facebook, will run in Massachusetts, New Hampshire, and Rhode Island for the next month. Anyone with information is asked to contact the FBI Boston Division’s Violent Crimes Task Force at 857-386-2000. Tips can also be electronically submitted at tips.fbi.gov. On Friday, March 15, 2019 at about 11:19 PM, officers from the Youth Violence Strike Force made an onsite firearms arrest of a juvenile male in the area of 63 Codman Park in Roxbury. Officers responded to a call for shots fired in the area with multiple units responding from District B-2 (Roxbury) & District E-13 (Jamaica Plain). The dispatchers provided a description of two males wearing black clothing running from Westminster Avenue through the backyards towards Cobden Street. Officers exited their cruiser when they observed two male suspects walking at a rapid pace. One of the suspects began looking left and right while making safety adjustments to his front pockets. Officers, fearing that the suspect was armed, conducted a pat frisk and immediately located a firearm in the suspects front pocket. Once the suspect was placed under arrest, officers found a second firearm in the waistband of the suspects pants. A Titan Tiger 38 SPL Revolver and a Smith & Wesson “Airweight” .38 SPL Revolver was recovered from the suspect. In addition, officers observed that the Smith and Wesson Revolver had five spent shells and appeared as though the revolver had been fired. The 17-year-old juvenile male of Dorchester was charged with two counts of Delinquent to Wit Unlawful Possession of Firearms and Delinquent to Wit Unlawful Possession of Ammunition. He will be arraigned Boston Juvenile Court. SAFER BOSTON: At about 3:30 PM, on Tuesday, March 12, 2019, officers assigned to District B-2 (Roxbury) responded to a call for a person shot in the area of 60 Annunciation Road in Roxbury. On arrival, officers located an adult male victim suffering from an apparent gunshot wound which is now considered to be non-life threatening in nature. The victim was transported by Boston EMS to an area hospital for treatment. Officers soon located several spent shell casings and other ballistic evidence in the area. Additionally, officers were able to broadcast a description of a suspect vehicle, including the make, model and a partial registration, which had been observed fleeing the area immediately after the incident. Less than six hours later, at about 9:10 PM, District B-2 officers observed a vehicle matching the given description travelling on Washington Street near Glenarm Street in Dorchester. Officers performed a traffic stop at which time they made contact with the occupants, identifying the driver as Antonio Williams, 20, of Roxbury and the passenger as Rafael Pena, 24, of Boston. In the best interests of officer safety, Officers removed both parties and performed a pat frisk of the two suspects and the vehicle which led to the recovery of a partially loaded 9mm Ruger SR9 handgun with an obliterated serial number. The firearm was located underneath the padding of an unoccupied children’s car seat in the rear passenger area of the vehicle. Both suspects were then placed in custody without incident. Antonio Williams and Rafael Pena will appear in Dorchester District Court on charges of Unlawful Possession of a Firearm, Unlawful Possession of Ammunition, Carrying a Loaded Firearm Possession of a Large Capacity Feeding Device and Possession of a Firearm with an Obliterated Serial Number. The investigation into the initial shooting call remains active and ongoing at this time. 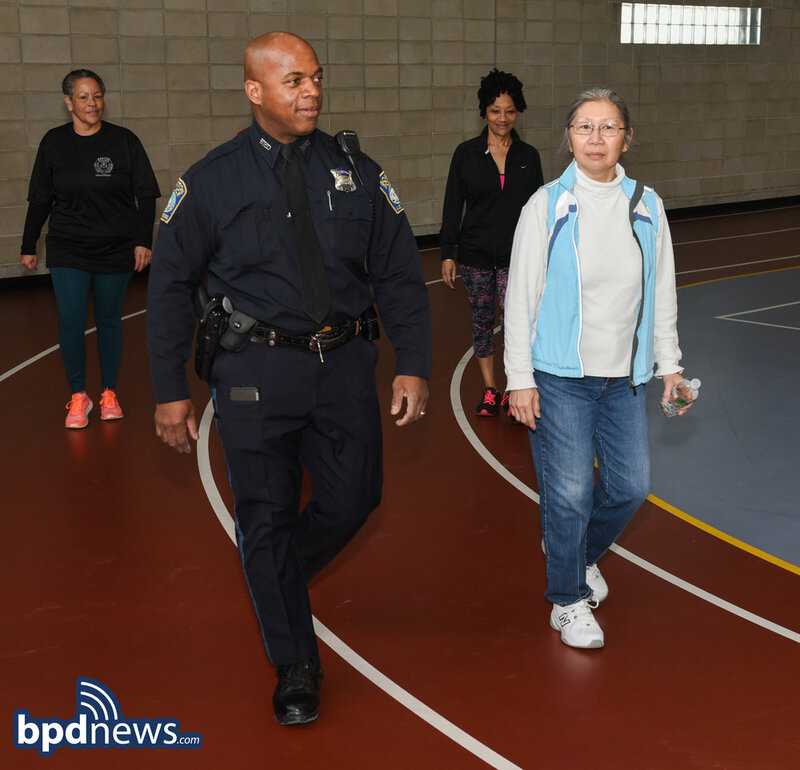 BPD in the Community: BPD Officers and Senior Citizens "Walk into Wellness"
IN THE COMMUNITY: On Thursday, March 7, 2019, Community Service Officers assigned to District B-2 (Roxbury) invited a group of senior citizens to “Walk into Wellness” at the Melnea A. Cass Recreational Complex in Roxbury. As you can see in the photos, a good time was had by all as the group learned how a regular diet of low-impact exercise, like walking, can contribute to a healthier and happier life style with multiple health benefits. Captain Terry Thomas and Deputy Felipe Colon stopped by to meet, motivate and encourage those in attendance while walking a few laps with the energetic group of participants. At about 9:57 PM, on Saturday, January 12, 2019, officers assigned to District B-2 (Roxbury) responded to a radio call for an unknown medical emergency in the area of 49 Blue Hill Avenue in Roxbury. On arrival, officers located an adult male victim suffering from multiple stab wounds. The victim was declared deceased on scene. The victim has since been identified as Edward Mowring, 70, of Roxbury. At about 6:00 PM on Saturday, March 2, 2019, officers assigned to the District B-2 Anti-Crime Unit (Roxbury) made an on-site firearm arrest of Tyrone Rutledge, 27 of Dorchester, and Andray Love, 29 of Boston in the area of 50 Sojourner Truth Court in Roxbury. Officers observed a white SUV idling while double parked and recognized the individual operating the vehicle to be Tyrone Rutledge and knew his license status to be suspended. Officers confirmed through CJIS that Tyrone Rutledge's license was in-fact still suspended. Officers then exited their cruiser to conduct an exit order of Rutledge and the front seat passenger due to his license status. Rutledge and the front seat passenger, later identified as Andray Love, were removed from the vehicle in order to conduct an inventory search of the vehicle prior to the vehicle being towed. Officers immediately discovered a silver firearm underneath the front passenger seat. The Firearm was found to be a Taurus PT92AFS 9MM loaded with 11 Rounds of 9mm ammunition in the magazine. Both suspects will be arraigned in Roxbury District Court. Update: The missing person alert for 19-year-old Darius “Jade” Chisholm has been canceled. Initially reported missing since 3:00 PM on Saturday, February 16, 2019, Darius “Jade” Chisholm returned home on Wednesday, February 20, 2019. The Boston Police Department is especially thankful and grateful to all who assisted in the search. At about 9:11 PM on Tuesday, February 19, 2019, officers assigned to District B-2 (Roxbury) responded to a radio call for a robbery in progress in the area of 800 Parker Street in Roxbury. While en-route to the above location, officers observed a group of males and females matching the description of the suspects who had apparently assaulted a woman, robbed her, then fled the area. As officers approached the group, additional officers tended to the victim who stated she had been attacked and robbed by four teenagers, two males and two females. The victim stated she was approached by the group while she was walking on Parker Street. The victim stated one of the males in the group shoved her to the ground before two additional members joined him in kicking the victim several times about the head and body while the fourth teen filmed the incident on a cell phone. The victim stated the suspects grabbed her cell phone and fled the area on foot. The victim was transported to a local hospital for minor injuries. The statement from the victim was relayed to officers who were speaking with the group who were able to recover the victim’s cell phone from one of the teens. All four of the teens were taken into custody. While placing the suspects under arrest, officers received additional information that a second victim had also identified the group as his assailants from an earlier assault and battery in which the suspects kicked the victim before unsuccessfully attempting the steal the victim’s backpack. Officers arrested a 17-year-old juvenile male of Mattapan, a 14-year-old juvenile male of Mattapan, a 13-year-old juvenile female of Roxbury and an 11-year-old juvenile female of Dorchester. The suspects are expected to be arraigned in Boston Juvenile Court on charges of Delinquent to Wit; Unarmed Robbery and Assault and Battery by means of a Dangerous Weapon (Shod Foot). MISSING PERSON ALERT: The Boston Police Department has issued a missing person’s alert and is subsequently seeking the public’s help and assistance in efforts to locate 19-year-old Darius “Jade” Chisholm who was last seen on Saturday, February 16, 2019 at about 3:00 PM. in the area of 14 Dubois Street in Roxbury. Darius “Jade” Chisholm suffers from autism and has made suicidal threats. Darius “Jade” Chisholm was last seen wearing glasses with blue tape on both sides, a black hat with a tan fur pom-pom, long dark orange jacket, black sweater, and brown Ugg slippers. Anyone with information regarding the whereabouts of this missing person is advised to contact District B-2 Detectives (Roxbury) at (617) 343-6694. On Saturday, February 16, 2019, Officer Kenny Grubs hosted Girl Scout Troop 82487 at District B-2 (Roxbury) for (RAD) technique class. The system is a program of realistic, self-defense tactics and techniques. It is a comprehensive course for women that begins with awareness, prevention, risk reduction and avoidance, while progressing to the basics of hands-on defense training. The girls were excited to take part in the training and enjoyed learning drills and techniques on how to defend themselves from an attack if need be. PHOTOS OF THE DAY: On Wednesday, February 13, 2019, Boston Police Commissioner Gross visited the Yawkey Boys and Girls Club in Roxbury where the Commissioner read the book I, Too, Am America. The book, written by Langston Hughes, provides readers a history of the Pullman railway porter, one of the first professions that offered African-American men a ladder into the middle class. The children listened intently as the Commissioner leafed through the pages of the highly inspirational tale. At the end, the Commissioner spoke about his own childhood in the inner-city, the people who looked out for him and the importance of treating everybody with dignity and respect. One Less Gun: BPD Officers Show Incredible Restraint While Apprehending Individual in Possession of a Replica Firearm: At about 11:07AM, on Tuesday, February 12, 2019, officers from District B-2 (Roxbury) were in route to a call for a person stabbed in the area of 148 Stanwood Street in Dorchester when officers observed three individuals who appeared to be fleeing the scene. Upon closer inspection, officers soon noted that the individuals were frantically motioning and pointing towards a blue minivan that was traveling on Stanwood Street. According to the individuals, the operator of the vehicle had threatened them with a firearm. In light of the information, officers immediately stopped the vehicle. With the vehicle stopped, officers instructed the operator to roll down his window so as to better facilitate their ability to talk to the man. However, instead of complying with the officer’s lawful instructions, the operator, while claiming he had rights, refused to roll down his window. Moreover, the operator disputed the officers’ reasoning for detaining him and told them that they had no right to stop him. When officers explained to the individual that there were multiple witnesses claiming he had threatened them with a firearm, the individual, unfazed, continued to disregard the officer’s lawful instructions. Fearing and believing the suspect was in possession of a weapon, officers instructed the individual that he needed to exit the vehicle. At this time, officers observed the individual abruptly turn his body and quickly lunge towards an object that appeared to be a firearm located behind the front passenger seat. Seeing the weapon and fearing for their safety, officers ripped open the car door and grabbed the suspect’s arm. During the violent struggle to gain possession of the gun that ensued, officers, yelling, repeatedly ordered the suspect to: “Drop the gun! Drop the gun!” After a brief struggle, officers were able to eventually gain possession of the firearm (see photo) and take the suspect into custody. Upon closer inspection, it was discovered that the firearm was a BB gun. Ironically enough, in spite of the indisputable levels of danger and peril that preceded the confiscation of the firearm, the suspect told officers that he carried the replica firearm for his protection. Officers arrested Eduardo Varanda, 25, of Lynn and charged him with Failure to Submit to a Police Officer and Assault by Means of a Dangerous Weapon (Firearm). The replica firearm and its six gold cartridges which house the BB pellets were later logged into evidence. It was later determined that the suspect had no criminal connection to the original call involving a person stabbed.